Landscape maintenance does not have to take up all your free time. 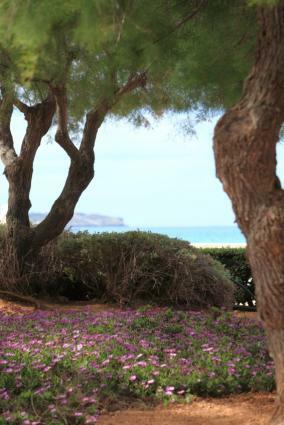 While there is no such thing as a zero-maintenance landscape, there are approaches that considerably reduce the amount of watering, weeding, trimming, mowing, pruning and primping required. Lawns can be high maintenance. If you have no need for a lawn, there are many other low maintenance grass-reducing alternatives to choose from. However, if you want a place for pets and/or children to run and play, you may choose to install a lawn. If so, it's a matter of choosing a low maintenance approach to having one. Low maintenance is relative to what you want to get out of the landscape. Try to clarify your primary needs in a landscape and then seek the best options to fulfill them. The right plant in the right place survives with less care than one forced to grow in less than ideal conditions, meaning less care is needed. This is true for any landscape feature, as well as for the materials that you use. For example, an exposed southwest-facing slope in a hot climate is a great place to grow cacti, but a poor place for a vegetable garden. Likewise, mulch may be an adequate path surface in a hot, dry microclimate, but concrete or stone is a better surface in muddy, low-lying areas. By familiarizing yourself with the characteristics of your property and the different parts of your property, you can make better decisions on what to put where. Those decisions will save a lot of work down the road. The plants native to your area are likely to thrive with relatively little care, as they do in nature. In the South, white pine would be a good example, which makes an easy-to-establish shade tree. In New England, sugar maple would be a good equivalent. Of course, not all native plants are easily grown - some require very specific conditions. But in general, a native plant nursery is a great place to start when planning a low maintenance landscape. Weeding is one of the biggest garden chores. Beds containing a mix of different perennial or annual plants are often full of weeds, because there is space between the plants for them to get a toehold. In contrast, swaths of densely planted groundcovers are relatively inhospitable to other plants - there is simply no space for them to grow. Examples of mat-forming groundcovers include juniper, low-growing varieties of ceanothus (good in the Western U.S.), prostrate rosemary and sedums. The plants listed above also happen to be very drought-tolerant, for which landscape designers use the term xeriscaping, meaning no supplemental water is required once they are established. All succulents are inherently drought tolerant, as are many ornamental grasses. Other common landscape plants with low water needs are lavender, euphorbia, lantana, beautyberry, vitex, butterfly bush, pine trees, eucalyptus and silk tree (mimosa). Any planting can be made more drought tolerant by spreading three to four inches of mulch around it. This also reduces the germination of weed seeds to virtually zero. 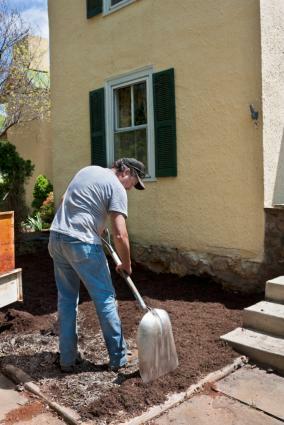 In general, mulch is a relatively inexpensive and easy way to cover the ground. By topping it off just once a year, it can create an attractive low maintenance surface for areas where plants are not needed, such as utility areas and play areas for pets and children. Consider it a lawn alternative in areas where aesthetics are not the top priority. 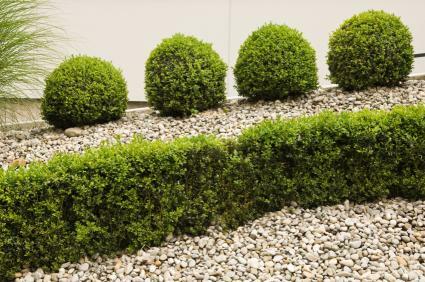 Decorative pebbles, gravel, river stones, mini-boulders and lava rock are another category of low maintenance groundcover. From tiny black pebbles that give a sleek, modern look to moss- and lichen-covered field stones that have a relaxed, rustic feel, there is a vast array of colors, textures and styles to choose from. The key to making stone a low maintenance groundcover is to place landscape fabric underneath it to prevent weeds from growing through. Weed fabric can also be used around plants for the same purpose. Decorative stone, combined with drought-tolerant plantings and lined with weed fabric, is a classic approach to low maintenance landscaping that has top-notch aesthetic potential. Just make sure to use professional grade weed fabric that will not fall apart in a few years and is breathable, allowing air and water to exchange with the soil underneath. If you want a lawn-like aesthetic, but don't require turf that can withstand foot traffic, there are many low maintenance alternatives. Ornamental grasses, which grow in a clumping pattern, are one. There are many grass-like plants, too, including ornamental reeds and sedges. In the shade, monkey grass or mondo grass are two non-grasses that form a thick groundcover with very little effort. Seeding a mix of wildflowers is another option. They provide a semi-naturalized look and are likely to attract loads of hummingbirds and butterflies. These can be mixed with seeds of wild grasses and are typically maintained by mowing just once a year in the fall. Finally, there are a couple of groundcovers that do tolerate some foot traffic - yarrow and roman chamomile. Both have attractive flowers and fragrant foliage. 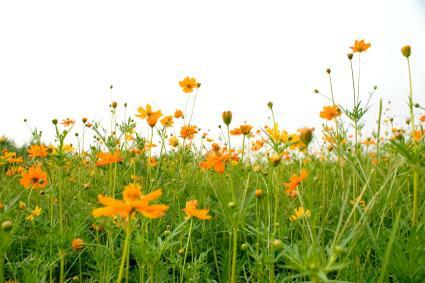 These, too, need mowing just once per year and are moderately drought tolerant. If you do plant a conventional turf lawn, installing some forming of edging to segregate it from adjacent plantings will reduce long term maintenance significantly. Otherwise, turf grasses will creep in to areas where they are unwanted. Metal, plastic, and wood options are available. Using just a few well-chosen species and avoiding inherently high maintenance things, like water features, is a necessary approach to creating a low maintenance landscape. Yet within those constraints there are still plenty of options to create a beautiful and functional outdoor environment to enjoy.